One of the main socio-economic indicators of backwardness of the Muslim community in India is the way waqf property is misused. The issue was studied by Rajinder Sachar, whose report renowned as Sachar Committee Report tabled in the Parliament of India in 2006 is a detailed analysis of the pathetic conditions of the Muslim community in the educational, political and economic scenarios. According to the report, there are 490,000 registered Waqf with landed properties spreading over 600,000 acres – 240,000 hectares – that will cost Rs 120,000 billion – USD 2400 billion. According to K. Rehman Khan, the Chairman of the Joint Parliament Committee (JPC) – which was constituted to study the issue – the third largest ownership of land after the Indian Railways and the country’s defence department is that of the Waqf. T.K. 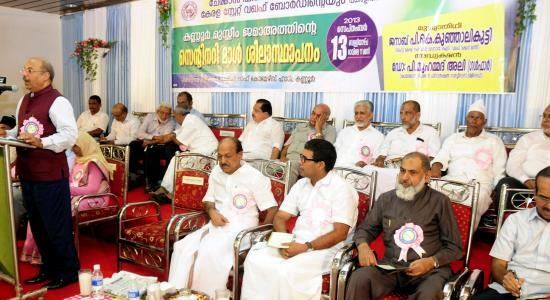 Saidalikutty and B.M.Jamal, Chairman and CEO of Kerala Waqf Board respectively, said that Kerala has nearly 34,000 acres of registered Waqf land. So, to think of proper ways to preserve and maintain this common wealth is as important as starting schools and colleges. Often, the community is directly responsible for its land lying idle. As it has already been duly registered as Waqf property, we can’t point an accusing finger at the governmental apathy and ostracism. However, we can’t close our eyes to the fact that some vested interest groups in the administration misappropriate Waqf land all across the country. The Joint Parliament Committee (JPC) pointed out a few years back that encroachments of Waqf properties by India’s state governments and private individuals were common in all states. But rather than waiting for the government to intervene, the community must thrash out strategies to preserve the land. The project for the construction of a mall on a Waqf property jointly launched in Kerala by the Cheraman Financial Services Limited (CFSL, India’s first interest-free financial services company backed by the Government), the Kerala State Waqf Board and the Kannur Muslim Jama’at in the second week of September is seen as a vanguard project in India to develop and make productive Waqf land that lay idle. The CFSL, which follows ethical investment principles in its activities and was established with equity participation of private investors-mostly from Gulf-based Non-Resident Indians (NRIs)-recently got permission from the Reserve Bank of India to function as a non-banking finance company, will construct the mall in Kannur district of Kerala. The mall has been proposed to have 25,724 square feet of building space being constructed on the Build, Operate and Transfer (BOT) basis. After creating value on the property and sharing the rental income for 18 years, the property will be returned to the Waqf authority. The foundation-stone-laying ceremony of the venture was convened in Kannur in the first week of September. In the presidential address, the CFSL Chairman Dr P. Mohamed Ali said that the venture with an authorized capital of Rs ten billion (USD 200 million) aims at creating value for Waqf properties to make them productive. For attracting investments, the CFSL would be adopting a Shariah-compliant approach. He cited the examples of countries like the US, the UK, Hong Kong and Japan that took Shariah-complaint legislative steps to attract investments from the West Asia. “CFSL’s business model is based on interest-free financing (IFF), which is based on the economic principles of Sharia,” said its Managing Director A.P.M. Mohammed Hanish. This would mean that there would be no speculative business and no Sharia-banned business ventures. Hanish noted that the Gulf countries have invested huge amounts of sovereign and individual funds abroad and a sizeable chunk of these were in IFF businesses. “CFSL will woo a portion of these funds so that Kerala’s and India’s infrastructure can be developed,” he said. Waqf in Islamic history is generally considered as a religious and charitable provision for providing public goods from education to health care to water supply and highway facilities on a voluntary basis. The emphasis on its socio-economic role came to the fore with the public sector starting to withdraw from performing an active economic role in the development of the Muslim community. It assumes significance in the context of the misuse of Waqf properties in the country. The JPC report records that almost 70 per cent of the Waqf property has been encroached upon. Of the remaining land, cases of corruption abound. In most of the cases, land is disposed off to builders, markets, hotels, industries and individuals at an unimaginably low rate of rents or leases. According to a report, more than 75 per cent of India’s national capital, Delhi, was owned by the Waqf but most of its properties were illegally occupied. This was because of the inadequate Waqf management laws. In most of the Indian states, the Waqf boards have become deeply mired in corruption and this can be gauged from the land scams like the one related to the Maharashtra Waqf Board that is reported to have given 4,535 square meters of land in a prime area to Mukesh Ambani for his 27-storey apartment. Another example is the case of the land worth more than Rs six billion in Bangalore leased to a famous hotel for a paltry amount. During the Muslim rule in India, there was no central body to preserve Waqf properties, set aside by emperors, nawabs and Muslims in the country for the upkeep of orphans, widows and for other social causes like education and healthcare. In British India, all the Muslim and non-Muslim endowments were managed by provincial governments and after India’s Independence, the management of Waqf properties was brought under the Central Waqf Council which has also proved to be a toothless body. Justice Sachar Committee had suggested an overhauling of the Waqf boards in the states as most of those who manned the top post were simply not qualified – it found that the CEO in Uttar Pradesh was a person from Unani medicine background while his counterpart in Shillong was class 10 failed. There were also suggestions for an Indian Waqf Service on the lines of Indian Administrative Service.